A 2018 study by Celent titled North American Policy Administration Systems 2018 presented a survey of policy admin solution customer satisfaction ratings. There were six criteria rated on a scale of 1 to 5: support, integration, technology, functionality, implementation, and configurability. We looked at the individual ratings and calculated an average customer rating across all 20+ vendors for each category. Customer satisfaction was highest with support, configurability, integration, and technological capabilities while lacking in functionality and implementation. This article will contrast industry standards for each of these categories with a microservices-based policy administration system and give some tips for insurance professionals on what they should expect from policy admin vendors. 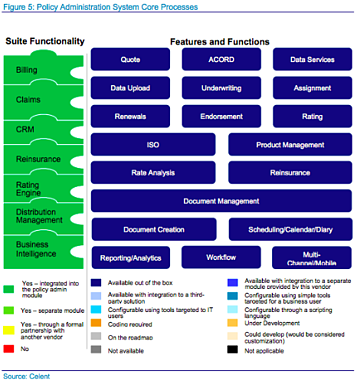 For reference, Figure 1 (left) is a diagram presented in the research which documents the wide range of functionality at least partially covered by most existing PAS solutions in the marketplace today. Suite functionality will vary from vendor to vendor; Company A’s platform might include reinsurance capabilities while Company B focuses mainly on primary policy administration. To test our microservices-based policy administration software, sign up for access to our Sandbox and evaluate freely with your team. Keep in mind, technology is improving at a rapid pace. Most available policy administration systems today are built on outdated monolithic architecture. These systems are tightly coupled, complex, not extendable and expensive to maintain. We suggest looking for a policy administration platform that is built from the ground up on a microservice based architecture. Microservices remove current constraints and aligns you with the changing tide of how insurance will be sold and managed in the future. Product Implementation, across the 20 policy administration vendors, ranked fifth out of six on a scale of satisfaction from one to five. What does this mean? It means insurers are frustrated by the competencies of implementation teams rolling out PAS solutions. This might take form in hearing promises that aren’t kept in terms of launch dates, lacking transparency around features and functionality being delivered, or communication-related deficiencies. Successful implementation of complex software like core insurance systems requires a marriage of both a solid architectural platform with the right people at the helm. It isn’t enough for a vendor to have a great development team with an outdated technology platform or vice versa. When evaluating the strengths and weaknesses of a policy administration vendor’s implementation processes, focus on their communication practices and the skill sets of team members assigned to your project. We emphasize complete transparency not just during implementation, but from the moment that sales conversations begin. Your first touchpoint should be built on honesty, respect, expectation, and alignment. During the sales process, look for sandboxes to allow you to assess the technology on your own. Conduct deep dive meetings on functionality, architecture and onboarding processes. Take the time to have detailed scoping workshops to ensure both teams are aligned, and proper expectations have been set on all project fronts. These activities set the foundation for a strong relationship and a smooth implementation process. These core principles extend past the sales process and into project implementation. We use an agile, iterative implementation approach, with emphasis on using third-party content where it’s appropriate. Our focus in every partnership is the rapid delivery of business value, continuous improvement, high-quality deliverables, and project transparency and visibility. These translate not only into optimal implementation timelines but also into a technology platform and partner that is aligned to your goals and requirements. Begin the process of vetting Solartis by speaking with one of our team members or by signing up for access to our Sandbox sites. Explore our unique approach to policy administration using a modern microservice based architecture and learn about how we use an agile implementation methodology combined with available and proven third-party content to expedite the onboarding process and reduce project risks.